1 of 2 In a large skillet, heat 1 tbsp olive oil over medium heat. Finely chop shallot and add half; cook, stirring constantly, until translucent, 2 minutes. Add 1 minced garlic clove and baby kale and spinach blend. Cook, stirring frequently until greens soften, 4 minutes. Transfer to a bowl, sprinkle with kosher salt and keep warm. 2 of 2 Combine white wine, fresh lemon juice, flour and chopped tarragon. In the same skillet, heat 2 tsp olive oil over medium heat. Add remaining 1/2 shallot and 1 minced garlic clove. Cook, stirring, 2 minutes. Add frozen bay scallops, defrosted. Cook 2 minutes. Turn scallops over and cook 1 minute. Stir wine mixture into pan; cook, stirring constantly, until sauce thickens, about 2 minutes. Stir in unsalted butter and a pinch of kosher salt. 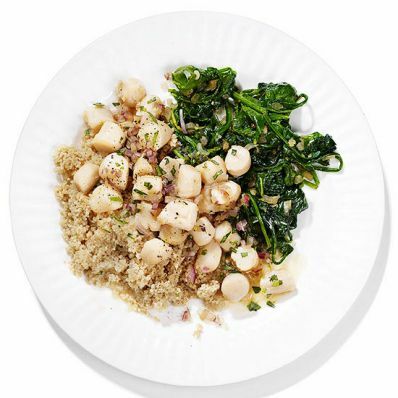 Serve scallops with greens and cooked whole wheat couscous.